Found in FNA Volume 9. Treatment on page 5. Shrubs or trees, 15–40 dm. Stems: young puberulent. 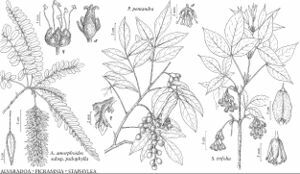 Leaves imparipinnate; petiole ± puberulent; larger leaves 8–14 cm, sparsely puberulent; petiolules 1.5–3 mm, wrinkled, ± puberulent; leaflets 5–11, ovate to narrowly elliptic, larger 6–12.5 × 1.8–5 cm, apex usually acute to acuminate, usually shiny adaxially, secondary and tertiary veins salient on both surfaces, glabrous except along midveins adaxially and at base near petiolule. Thyrses 6–20 cm. Pedicels: staminate 0.5–0.7 mm; pistillate 1–2 mm. Staminate flowers: sepals lanceolate, 1–1.2 mm, puberulent; petals lanceolate to narrowly oblong, 1.5–1.6 mm, glabrous; intrastaminal discs circular; stamens 5, filaments 2.2–2.8 mm, anthers dorsifixed; pistils vestigial. Pistillate flowers: sepals triangular, 1 mm, puberulent; petals narrowly oblong, 1.3–1.6 mm, glabrous; stamens 0; pistils ovoid, 1–1.5 mm, glabrous, stigmas 2, slightly divergent. Berries becoming black, spheric to ellipsoid, 6–9 mm diam., glabrous; pedicels 7–10 mm. Habitat: Hammocks, pine woodlands, on limestone. Fla., West Indies (Bahamas, Cuba), Central America, n South America (Venezuela). In the flora area, Picramnia pentandra is known from Miami-Dade County.